Rated PG. Parental Guidance. General viewing, but some scenes may not be suitable for young children. Brand New. Factory Sealed. This is an Eros Internationl brand of the Hindi DVD. Has the UPC Code 5055179411558. Has EROS Seal. Full Screen. 139 minutes Color. Dolby Digital 5.1 Surround Sound. NTSC FORMAT-ALL REGIONS. BOTH MOVIE & SONGS HAVE ENGLISH SUBTITLES. Produced by:: Rakesh Roshan & Vimal Kumar. Directed by: Surendra Mohan. Music: Rajesh Roshan. Lyrics: Anand Bakshi. Starring: Rishi Kapoor, Rakesh Roshan, Tina Munim, Ranjeet, Ashok Kumar & Pran. Shipped promply via USPS First Class Mail after payment has been received, with delivery confirmation label. Release Date: 1980. Ram and Rahim are childhood, inseparable friends. They complete their schooling and enroll in a hostel for their higher education. One of their colleagues, Kundan frames them for molesting a girl and has both rusticated. Without any means to survive, both masquerade as a male and a female and get employed as tutors to a wealthy young girl, Sameera. Both fall in love with Sameera, and both think that she loves him and him only. Sameera must now decide whom to choose. 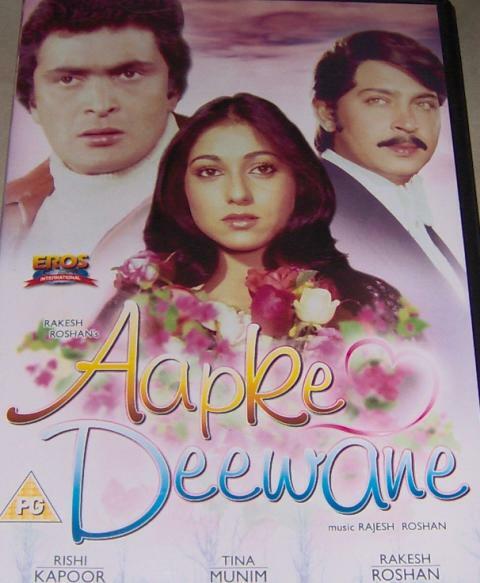 Buy Aap Ke Deewane (DVD, 2005), sold & shipped by Movie Time Video where you can shop online for Pooja Mandir, Bajot, Gifts, Hindi Movie DVD / CD, Music Video. This Hindi Movies collection has been tagged as VS8-12 ER9 1 sam RR 2.00 7.49 rishi kapoor tina munim rakesh roshan RR 1.50 8.49.